I recently posted about European microcars, which are still a thing. 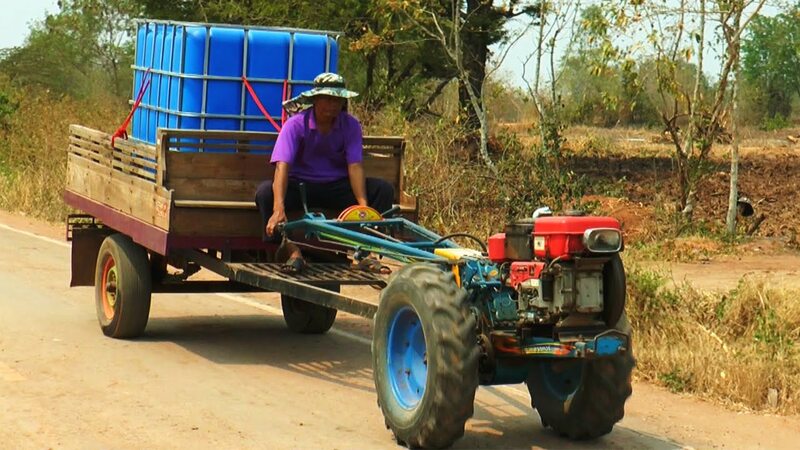 But mobility is a global issue – especially in rural areas, where motorized transport necessarily doubles up as a working implement. Thailand has developed an interesting and novel approach to the problem over the past decades, resulting in a unique cottage industry that is still thriving today. 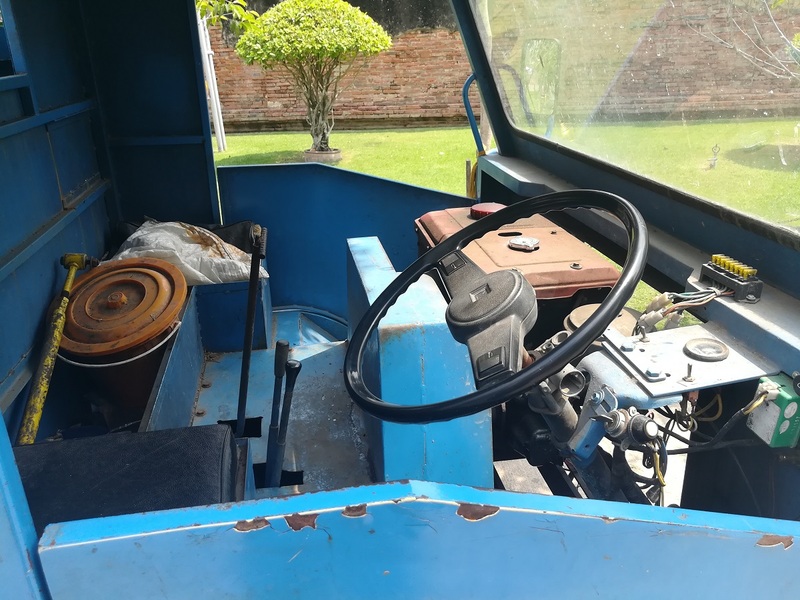 In the ‘50s, a company called Siam Kubota started manufacturing a cheap and durable two-wheeled tractor, powered initially by gasoline – but a single-cylinder 14 hp (DIN) Diesel soon became the standard. 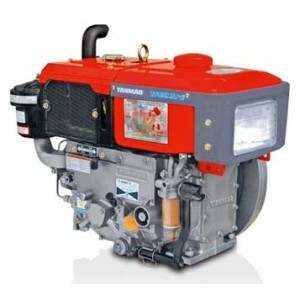 This Kubota engine was soon used in all sorts of stationary uses (pumps, generators, etc.) all over the country. The tractor slowly replaced the buffalo and the ox in field work, but was also immediately adapted for transport. 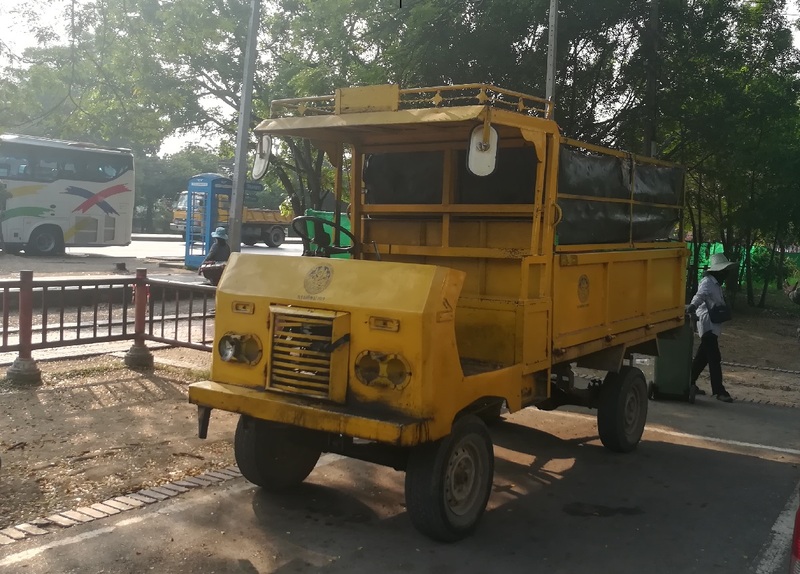 These contraptions, which the Thais call e-taek, are very common all over Asia, are doubtless being made in several locations and countries, including China. But it seems the original concept – or rather, the first successful widespread use of an old concept in this part of the world – emerged out of Thailand. 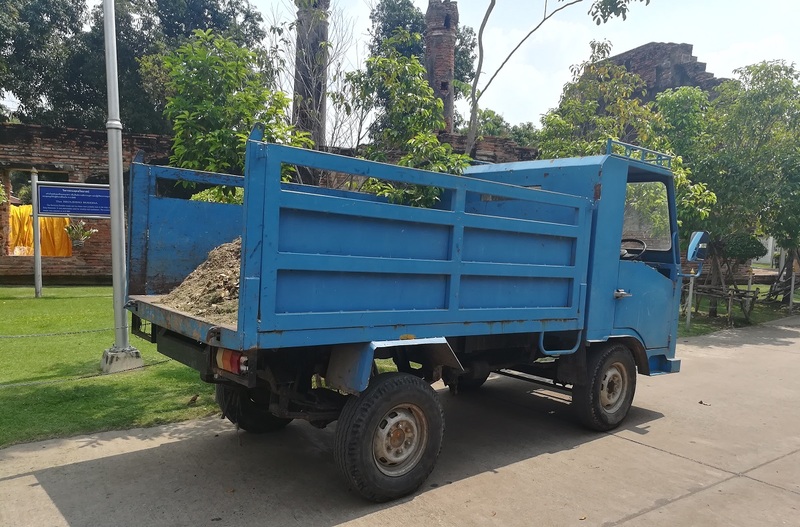 By the ‘70s, there were enough local mechanics and spare auto parts of all kinds being made in Thailand that a form of truck began to appear – closely linked to the e-taek, whose engine it employed. The e-taen (อีแต๋น) was not designed by anyone in particular. It’s literally a spare parts special. 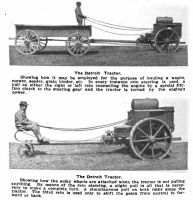 In small towns around the country, local mechanics and metalworkers were able to make the chassis and a rudimentary body for a very cheap price. We’re talking the equivalent of US$ 3000 here. So a little dough could be set aside to paint garish decorations and the like – the rice farmer’s custom job. The example above, which I found on the interwebs, is a relatively restrained example; Google has a lot of wackier images on offer. But many of these are just workhorses, with little or no bodywork, multicoloured or not. 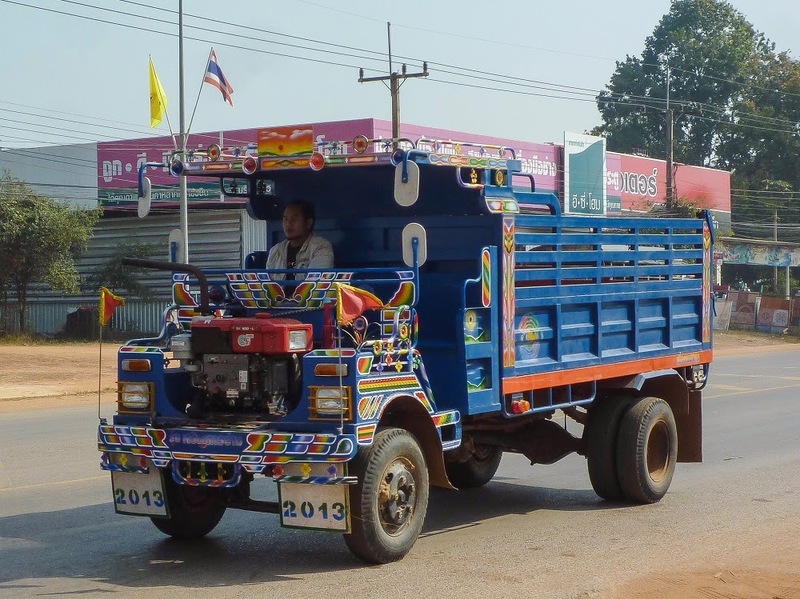 There’s little hard info out there on these Thai farm trucks. The Chinese-made ones I have seen all over Myanmar are usually less crude, with a proper cabin. Here, we’re seeing a truck that looks pretty similar to a pre-First World War design – body-wise, that is. Aerodynamics don’t matter much when you’re only going 20 mph max. The engine is always east-west in the E-taen, unlike the (very) longitudinal two-wheel tractor that preceded it. I have no idea why that is exactly. No idea about the gearbox either. 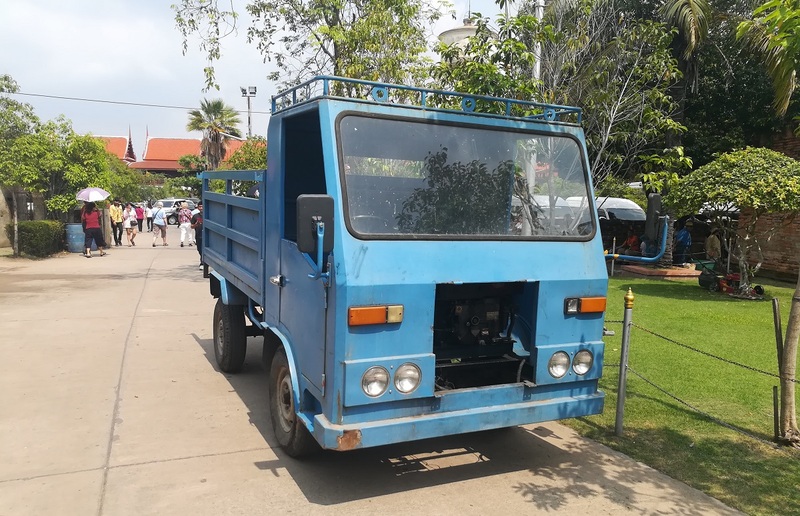 The chassis, steering and brakes are usually sourced on old Japanese pickups, which are numerous in Thailand, but modified with a beam front axle. The engine choice seems to be broadening to Yanmar Diesels – another link to the European microcars, though I believe most of those have twin-cylinder engines. Many e-taen seem to be unregistered vehicles. 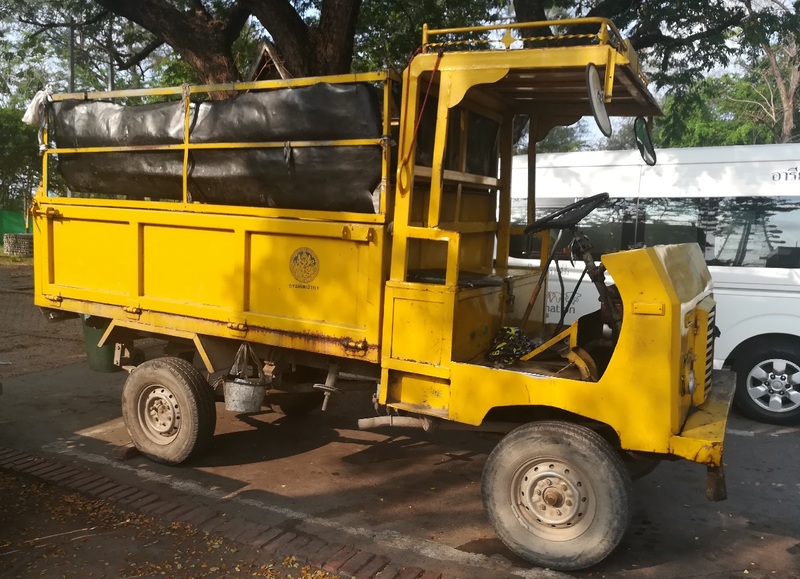 As long as they are used for local farm/construction work, they are not considered a road vehicle as such – though they may use the road on occasion. This means anyone can drive one of these without any sort of license. Imagine these, plus normal trucks, pickups, cars and a lot of families on two-wheelers, mix with cheap local whisky and beer, and you get a country that is #2 in the world (after Libya) in terms of road fatalities per capita. Some e-taen are used mainly for road transport and are registered, but it’s unclear whether a license is needed even then. The engine, topped by its fuel tank, sits in the cabin in these cab-forward models, but this isn’t always the case. There is something fascinating about the utter simplicity of these trucks. This is about as basic as motorized transport can be. In this one, you do get a windscreen. But you really don’t get much else. Certainly no wipers. I found these two in Ayutthaya, the former Siamese capital (and current industrial heartland), about an hour north of Bangkok. If you fancy the slowest and most basic hand-made trucks ever conceived, you’ll know where to go. I’m always amazed at how necessity really is the mother of invention. Thanks for sharing these pics. Very cool, necessity is the mother of invention. A friend of mine had a Ferrari diesel roto tiller that was designed for the same thing as it has a road gear and an available accessory trailer that could be had with a driven axle from the tillers pto. Talk about all terrain. The tractor certainly brings back memories of Korea, circa 1990, when whole families would come into the farmer’s market on a wagon pulled by the ubiquitous Kabota tractor. I recall one sunny Sunday, a farm family was selling its wares from their wagon, while liberally imbibing in the local firewaters, soju and makkoli. They were insistent that I have a meal and drink with them, even though at the time I knew no Korean, and they no English. I had a great time, but it grew foggy towards the end! The East-West engine in these is a bit curious. I wonder if they use hydraulic drive? 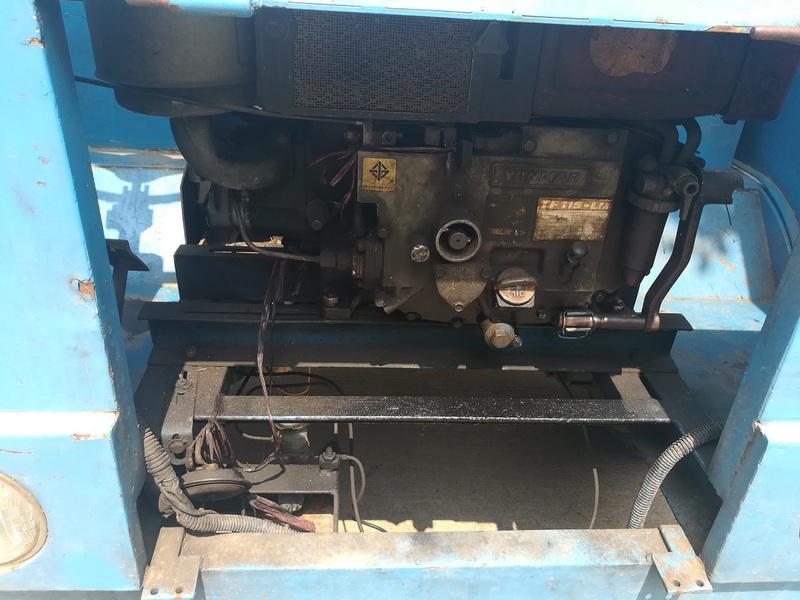 A close up of that Yanmar engine looks like that’s what’s on the end of it, not a clutch or other mechanical drive from it. It’s about the only explanation I can come up with. Their history goes back to both the US and Europe to the early part of the 20th century. I’m also unable to work out the benefit of having a transverse engine here. Both trucks had a transmission arm to the rear axle. I just don’t know the exact means of transmission. I don’t know what you mean by “transmission arm”. Sorry, gallicism attack there. I mean a drive shaft. What do you mean by hydraulic transmission, btw? Point well taken on photographing these though — when I find one again, I’ll try and focus more on the underside! I see the the problem: what you take to be “east-west” is not so at all; they are north-south; the housing is just wider in the sideways direction. These are one cylinder diesels, with the cylinder in a horizontal position (to the left, looking at it from the front). The picture below clearly shows the flywheel behind it. And one can see the hub for the front end of the crankshaft in the middle of the block in front. I remember these well when I was in Thailand 20 plus years ago. Glad to see they are still plying their trade. The Thai’s have a way of hacking mechanical systems and making them their own. Like their dragon boats powered by everything from rototiller engines to the old Toyota truck’s engine that was still running long after the rest of the truck had succumbed to the tin worm. I always thought something like this would be great for moving around dirt or wood at the acreage my father has. Instead of a $12000 gator. But I am too lazy or not skilled enough to make the Canadian version. 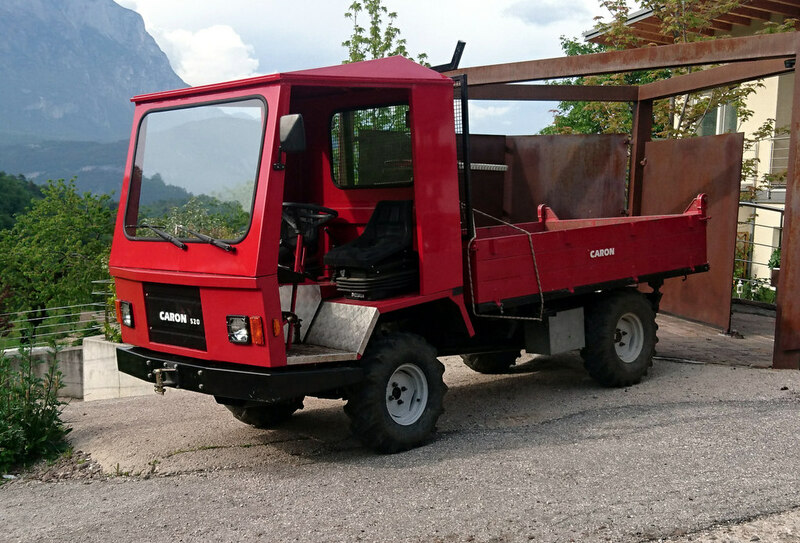 These kinds of off-road trucks are a common sight in the Alps. There are several companies in Italy that make them. Apples & oranges. The Thai version is not engineered, it.’s literally cobbled together by anyone with a blowtorch and a scrapyard. Those Italian thingies are more in the milk van / golf cart category and are made by proper (if small) firms.